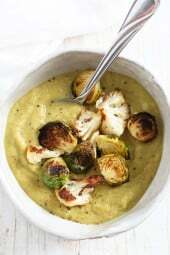 I am also curious about the making ahead, as I would like to add this to my Thanksgiving menu! Has anyone tried making this and then putting in a casserole dish to make ahead? Thinking of making this for Thanksgiving but want to be able to make it the day before, if possible. Gina – I don’t have a hand masher, ok to use a mixer? Maybe don’t mash like you would regular mashed potatoes. And my store, didn’t have fresh chives, ok to use the freeze-dried? This looks delicious! I wonder if you could substitute sweet potatoes in this recipe. Have you tried before? Hi! I don’t have buttermilk…how can I make my own? Milk and vinegar? Thx! They sell a powder version which I love. Thanks for this recipe. I make mashed potatoes a lot, and I definitely use more butter plus cream and whatever fattening junk sounds good lol… I was really pleasantly surprised at how delicious mashed potatoes can be with so little butter! I made this with your Salisbury steak recipe and some roasted carrots…. Delicious. Could these be prepared ahead of time? Thanks. How can I prep this a day in advance? Do you think these would cook well in crockpot? Yes I think they will. I made these tonight with your skinny chicken cordon bleu- so delicious! Even my husband liked them, and he's not a mashed potato fan! Gina – my fiance and I are both from Irish American families (we eats tons of potatoes) and these are hands down the best mashed potatoes we've ever made! So easy! Only a few ingredients! I did use a mixer just to make sure I got a smooth consistency (I know – I'm a traitor to my roots), but there is not a thing about this recipe that could be improved upon. Can these be prepared ahead and reheated in a casserole? Was hoping to save some time on Thanksgiving Day. Thanks! Do you think I can combine cauliflower with potatoes to lighten this even more? Thinking of doing in the crockpot for Thanksgiving. I used the frozen mashed potatoes that you pop in the microwave and steam them. Added the rest of the ingredients, so easy and good. Thanks for the recipe! Hands down the most incredible, guilt-free mashed potatoes I've EVER experienced. My picky-eater boyfriend raved about them and we both had THIRDS. Two days later and reheating requires absolutely zero moisture added – they're still creamy and delicious. 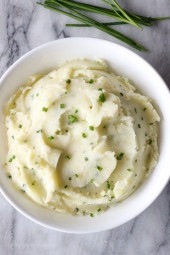 An added bonus – this was by far the easiest recipe for mashed potatoes I've ever used. I kept the skins on for added vitamins (and because I'm lazy) and they are just incredible. Yum these are so good. I made these twice, the first time I used an immersion blender which I recently found out NOT to use for mashed potatoes so they were kinda pasty. But the second time they were great! I used soy milk to make them vegan, I just add a tablespoon of vineger and let it sit for a couple minutes. Will definitely be making these again. These definitely tasted "light," but they were good! I would make again, but maybe add some shredded cheese or use real butter (and adjust the points accordingly). i've made a bunch of your recipes so far gina, but i have to say this is probably my favorite ever. so simple but amazing!! with the pork chops w/ mushrooms and shallots, i couldn't believe i had actually cooked the whole thing myself. plus, i'm terrible with seasoning things just right, and somehow with this recipe it seemed like after just one pass with the salt shaker, it was already good to go. thank you!!! Yum yum yum! Yum Yum Yum!! My 2 year old son took giant bites and only ate these potatoes. He wouldn't touch anything else on his plate and asked for more. LOL. Being a total mashed potato lover, I must say that I made these the other night for my family and everyone LOVED them. Even the pickiest of eaters went back for THIRDS (yes, I said thirds). Not to mention this was one of the easiest side dishes EVER to make. Thank you so much. This website is inspirational! So good. I don't know what else to say. It was hard for me to stop myself after having a taste to make sure my seasoning was right. My 7 year old kept saying how good they were. Thanks a mil. I made this tonight and it was amazing!!! i honestly didn't miss the "normal" amount of butter/margarine I typically use either. I added some onion powder to mine as well since I typical sauté some onions and add them to my mashed potatoes!! YUM YUM!!! These were terrific! My husband never compliments anything. His highest meal compliment is "Yeah, it's good" (infuriating, btw). He looks at me with a mouthful of these potatoes and says "These are REALLY good" with a strong emphasis on "really". That is some seriously high praise! Thank you for all the wonderful great tasting recipes! My family love them!! I made the skinny mashed potatoes the other night, and they were delicious! My family had no clue that they were "skinny" mashed potatoes! I have made this recipe 3 times this week it is that good and there never seems to be any leftovers the next day because a little fairy seems to be eating them at night when we're all asleep! 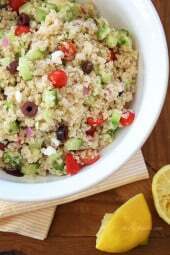 Seriously Gina, this recipe is the bomb! I'm glad you think so Jenna! And I'm really glad you all liked this. Katheryn, I usually use my masher myself. I'm going to change the directions. I used the immersion blender and they turned to paste. 🙁 Next time I will hand mash. The taste was good, but I ended up tossing them. I'll definitely try again! I made these last night with pork chops and they were good! I had to add 1/4 c. fat free milk because mine needed a little more liquid, but that may have been a cooking error on my part. I also used real butter because I didn't have light. I realized after I made it that I had more than 5 servings, so after weighing, measuring and portioning, I totaled up the WW pts and it came out the same. Your carnitas are on deck for tomorrow's meal! I made these today with my marinated flank steak along with your oven baked zucchini and marinara sauce. The only substitution that I made was that I used russet instead of yukon gold. My husband was giving me a bit of a hard time because he said he didn't like buttermilk. I of course bought it anyway and it was a HUGE hit! These little babies will be on my Thanksgiving table for sure! Also, it was my first time using "light butter" so I splurged a little with two tablespoons, but I don't think I even needed that because you honestly could not tell!! If I had known back then that low fat cooking tasted so good, I would have started a long time ago! Thanks Gina! 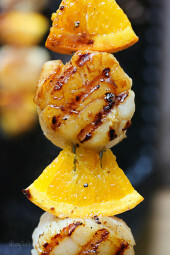 Made these tonight – fabulous solid recipe, not to fancy, just darn good. These will be on our thanksgiving table. These were delish! My only problem was my buttermilk curdled a bit…not sure how I avoid that? Never had buttermilk in my mashers before…this sounds great! Check us out sometime @ BloomEveryday.wordpress.com. We can't wait to start sharing recipes with you! I made this tonight with herbed chicken and black-eye-peas and the family LOVED it. I used a potato masher tho- my family likes their potatoes with some chunks in them rather than baby-food creamy. (I like them creamy tho). TY for a skinny version of a favorite dish!!! YUM! I was going to make some goat cheese stuffed chicken breasts for dinner tonight and I was trying to figure out a second side to go with my sauteed kale. I think this might be a winner! Russet potatoes would work too. Your flank steak sounds divine. I may have to try that! looks sooooo good! I LOVE potatoes! I just bought a big bag of russet potatoes on Tuesday. Does it matter if I use those instead of the Yukon Gold ones? I make a mean marinated flank steak (marinade made up of teriyaki and garlic and put in the fridge over night) in case you wondered. I then broil or grill it! KILLER and so easy! My family's favorite meal is the flank steak and mashed potatoes so I want to make certain that the russet will be ok. Can you please help? I really like this idea. I have some buttermilk to use up and this sounds lovely! Yum, sounds perfect! I haven't had mashed potatoes in a long time!! I love my ricer. Do you just put everything thru it? Or jut thE potatoes and then add the other ingredients? Will try it soon. That looks delicious. A coworker of mine farms potatoes so I've been looking for some good new potato ideas. Mmm these look so good like they would just melt in your mouth! Ooooh these look so creamy and delicious!! 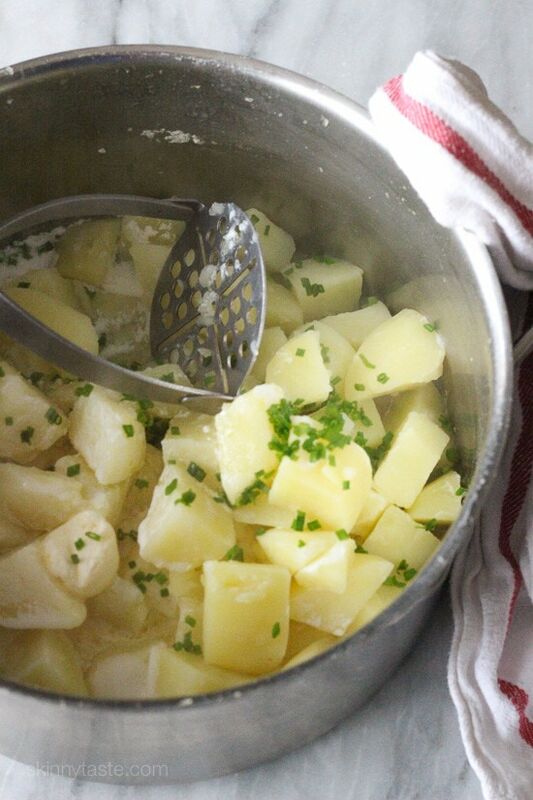 I've never used buttermilk in mashed potatoes…definitely going to be trying it out soon! This recipe looks delicious! The mashed potatoes are perfect to make for Thanksgiving. I love that you've added chives to the dish. 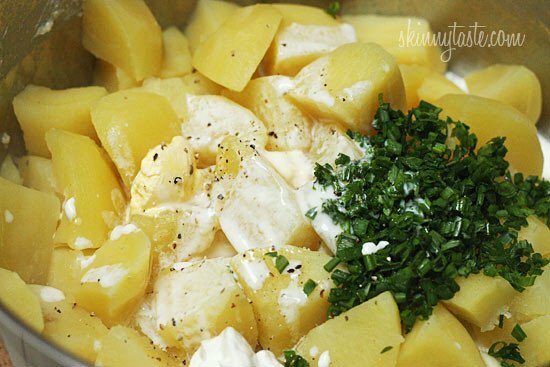 I'm looking forward to making these potatoes for the holidays! This looks so good. I'm going to make them this weekend with the pork chops with mushrooms and shallots. YUMMMM. Can't wait!!! I'm so happy you posted this! I just bought the smallest carton of buttermilk I could find(which was the quart size) to make your Buttermilk Ranch dressing recipe (tasted great by the way) and was trying to figure out what else to use it for. Thank you, thank you! I've been hoping you were going to post this since you mentioned it with the port chops – I'll be making these Sunday night as a test run for Thanksgiving! Wow, lovely pictures and great recipe for Thanksgiving! I will have to try . . . Sounds good, will try this recipe soon.